Something I needed to write for myself this week having faced an extraordinarily stressful few days. I hit a brick wall on Wednesday and realised I needed to implement some of my own mindfulness strategies and deploy a few life hacks and productivity tricks. Admittedly it took me a few days to bring some coherence to my madness but I achieved it and within 48 hours of first experiencing overwhelm, I’m back on the right track. So what did I do? And what did I learn that I can share to help you too? Switch off all distracting activity and noise-creating devices. When you’ve already got a million things demanding your attention, the last thing you need is more synaptic activity being triggered by unnecessary noise. Turn off the fan or air conditioning units, turn off the dishwasher and the washing machine, put your phone on flight mode and your laptop on mute (just whilst you get your sh*t together), and if you’re in a busy office, get the hell out of there. You need peace & quiet to focus your thoughts. Create an almost eery silence around yourself, and then breathe a sigh of relief. THAT was productive. For those of us with crazy lives, just achieving silence is no mean feat!! Overwhelm can cause us to procrastinate and run around in metaphorical circles going nowhere fast. It also pulls us to the sofa where all we want to do is nap and escape the reality of what we’re dealing with. So let’s figure out exactly what we are dealing with before we force further feelings of guilt on ourselves as a result of having caved to the calling of the sofa! Grab a piece of paper and make two columns. One headed ‘personal’, the other headed ‘professional’. Now under each column write a list of all the things in each category that are overwhelming you. Then once you’ve got it all out on paper, reassess the list and number the items from 1 to 10 in order of priority. You can have a 1-10 priority list for personal and another for professional. If there are more than 10 things on the list, they can wait until tomorrow. Now of your top ten things on each list, what can be delegated, and what can realistically be achieved today? If something can be delegated write the initials of that person next to the list item. Anything that needs to be done today put a big circle around. The rest assign a completion date to, for either yourself or a delegate to manage. What time is it now? How many hours do you have left in the day? Split the remainder of your day into one-hour sections and assign each of these tasks a one-hour time slot for completion, and don’t forget to assign a good half an hour to ring or email your selected delegates to help you complete some of the tasks. Make sure you also schedule an hour for yourself before bed to unwind and chill, otherwise you’ll go to bed wired and won’t sleep! It might seem obvious but if something can’t be achieved then let it go. Perhaps it wasn’t meant to happen? Putting pressure on yourself often results in getting less done which is completely counter-intuitive. If it’s genuinely out of your control then no amount of stress is going to make it any better. The headless chicken imitations here are futile. Do what you can so that you feel you’ve ‘tried your best’ (otherwise the guilt thing rears its ugly head), and let the rest go… you’re only human. It happens to the best of us, but let’s try avoid repeat performances shall we? You got through the day, you’re still alive. Congratulations. But let’s stop the cycle, shall we? I don’t want you facing another day like that, and I’m sure you don’t want to either. So let’s take a look at how you got yourself into ‘overwhelm’ in the first place. Are you taking too much on? Are you putting yourself under pressure? Are you allowing someone else to expect too much of you? Are your standards impossibly high? Are you trying to control or perfect something which can’t be controlled or perfected? Do you have negative self-talk? Are you trying to be something or someone you’re not? We often say yes to things because we feel a need to please or impress others. The social survival tiger kicks in until we overload with information and responsibility and eventually spontaneously combust. Your wellbeing is far more important than social status, recognition, maintaining pretences, self-criticism, unrealistic self-expectations, and negative mind chatter (which clearly at some point has convinced you all this is normal). Learn to say no. Learn to manage your lists. Learn to delegate. 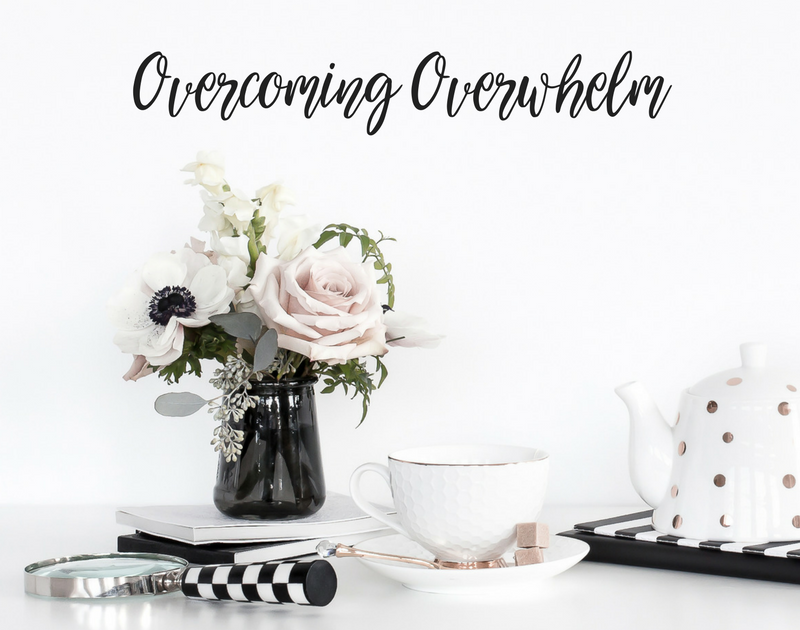 And if you have to, learn to implement this 5 step strategy so you can at least overcome overwhelm next time it hits.